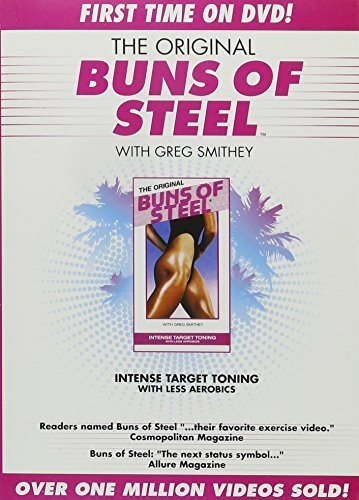 BUNS OF STEEL is devoted to strengthening, tightening, toning and shaping the buttocks (buns), thighs and upper legs. Through a grueling but effective series of exercises following a brief aerobic warm-up, Greg Smithey, former World Class pole vaulter, leads you on the road to a tighter, sleeker, lower half. Greg incorporates the lower body strengthening exercises he used to train for vaulting into his demanding, targeted routine. Once you see the remarkable results, the hard work will be worth the effort!